This Appendix provides additional detail on the modeling of the clean energy pathways conducted for this report. This section reviews the objectives and research approach of the report, and presents the basis for the CO2 emissions target for 2050 that drives the analysis. Section 2 provides details on the model and methodology applied, and Section 3 describes the design of the clean energy pathways. Section 4 presents and explains the modeling results. Is creating a clean energy economy technologically possible? What would it cost the U.S. economy, and how would specific economic sectors and regions be affected? What impacts would such a transformation have on economic growth and standards of living? The modeling builds on work conducted for the Deep Decarbonization Pathways Project (DDPP)1. 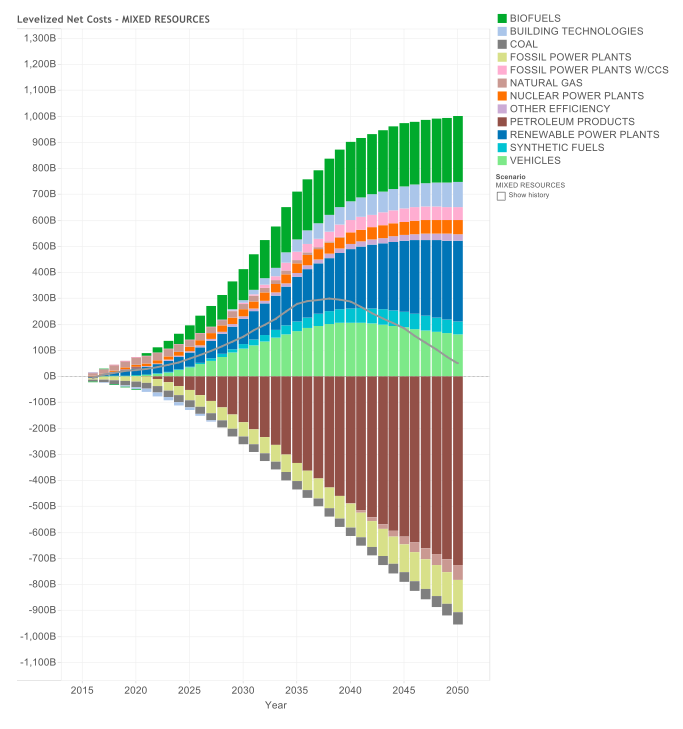 That body of work, originally published in 2014 and updated in 2015, aimed to answer similar questions and it developed highly detailed pathways for changes in energy systems, infrastructure, and investments that could reduce total U.S. GHG emissions (CO2 and non-CO2 gases) by 80% by 2050 from 1990 levels. This report focuses on energy-related CO2 emissions, which currently account for more than three-quarters of total GHG equivalent emissions in the U.S.2. As in the DDPP, we applied EnergyPATHWAYS (hereafter referred to as PATHWAYS)3, a model covering the energy sector and all energy-related CO2 emissions4. We updated key model inputs to reflect the most recent available projections from the Energy Information Administration and other market trends. We made some changes in the projected composition of the vehicle fleet to reflect the latest technology trends. We improved the sophistication of the underlying model, distinguishing between physical vs. financial lifetimes of assets, better representing the electricity distribution system and distributed generation resources (such as solar PV), and incorporating more sophisticated thermal dispatch algorithms to include maintenance and outage schedules. We developed a “low fossil fuel price” scenario to explore the impacts on fuel costs of a successful global effort to substantially reduce fossil fuel use, in addition to using the “reference case” projection of fossil fuel prices as in previous DDPP modeling. We created a side analysis of the effect of autonomous electric vehicles on emissions. How fast new capital investments would ramp up in clean energy pathways. An 80% reduction in CO2 emissions is a reasonable initial benchmark for a clean energy economy, and we have kept this reduction target as in the original DDPP study. The U.S. has official GHG reduction targets of 17% by 2020 and 26-28%by 2025, relative to 2005 emission levels, which the Obama administration stated: “…will keep the United States on the pathway to achieve deep economy-wide reductions of 80 percent or more by 2050”5. 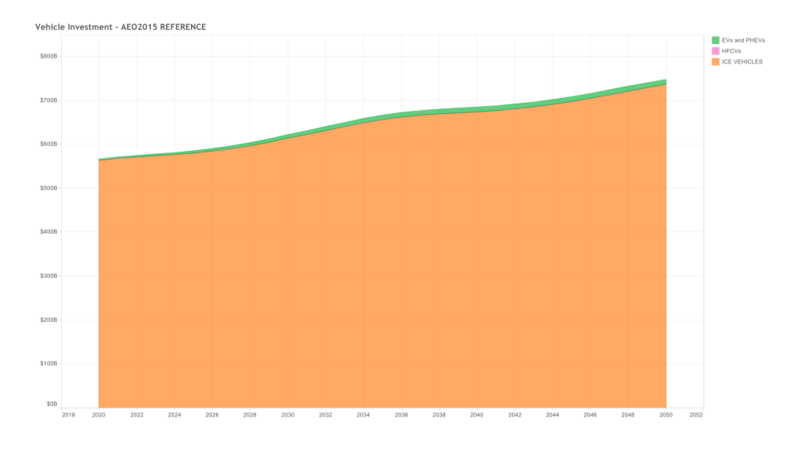 An 80%reduction from 1990 levels would translate to a 2050 target of 1080 MtCO2e in net GHG emissions (accounting for a net CO2 sink from land-use, land-use change, and forestry), and a 2050 target of 750 MtCO2 from energy-related emissions. Section 1.5 of the DDPP 2015 Technical Report has additional detail on historical U.S. emissions and target setting. This section provides details on the model and methodology applied. PATHWAYS was originally developed by Energy and Environmental Economics, Inc. (E3) to model energy-related CO2 emissions and is currently developed and maintained by Evolved Energy Research6. The PATHWAYS model is a bottom-up, stock rollover model with similar structure and inputs as the National Energy Modeling System (NEMS). PATHWAYS simulates in detail the existing stock of electricity power plants, autos, homes and commercial buildings, factories, and other energy-using infrastructure. Energy demands are supplied through three model modules representing electricity, pipeline gas, and liquid fuels, with sufficient detail in the electric sector to simulate dispatch and reliability requirements at the regional level. PATHWAYS projects the accompanying CO2 emissions and energy system costs of meeting an exogenous demand scenario. The composition of energy technologies in each case accounts for their unique characteristics and is designed to simulate a cohesive and plausible future energy system. Section 2.2 of the DDPP 2015 Technical Report provides additional detail on the PATHWAYS model. A key strength of PATHWAYS is the very granular level of detail it brings to modeling of the energy system as a whole, and to the electricity sector in particular. The model simulates the electricity system’s hour-by-hour production costs and the availability of generation resources and flexible load, accounting for regional variations in current electricity supply mixes and demand, as well as the variability of renewable sources such as wind and solar. PATHWAYS can explore in detail how much electricity is available for production of “electric fuels” (i.e., hydrogen or synthetic gas), effectively storing electricity when supply exceeds demand. PATHWAYS can explore strategies that require coordination between the electricity and transport sectors in ways that conventional economic models simply cannot. PATHWAYS can explore multiple pathways to meet a fixed set of demands for energy services. However, it does not attempt to model the interaction of demand and supply through the price mechanism, though it can project changes in total energy system costs for a given set of prices. PATHWAYS is not a partial or general equilibrium economic model, nor is it an optimization model. It is not designed to project macroeconomic impacts or to determine which clean energy pathway is “best” from a narrow criterion of cost-effectiveness. Modeling typically begins with specifying a “reference case” or “business-as-usual” scenario that relies on current conditions and projections of key drivers like population, gross domestic product, vehicle miles traveled, industrial value added, commercial sector floor area, number and size of residential buildings, levels of energy efficiency, energy prices, etc. These, in turn, determine a level of energy demand and associated energy system costs and CO2 emissions. The implications of different pathways can then be measured in relation to changes from the reference case. The reference case for this report used inputs from the Annual Energy Outlook 2015 (AEO 2015) forecast, the U.S. Energy Information Administration’s (EIA) official forecast for the U.S. energy system in the absence of additional policies7. For purposes of our report, we label this the “High-Carbon Reference Case” in order to contrast it with clean energy pathways that would dramatically reduce carbon emissions by 2050. It should be noted, however, that this High-Carbon Reference Case does not reflect the economic changes that scientists predict global climate disruption will cause by the middle of this century. Thus it does not take into account how climate change will harm economic growth and business investment, and reduce GDP and living standards more broadly. On the surface, it is “business as usual” but, in fact, business will no longer be “as usual” in the future if the U.S. and the rest of the world remain on a high-carbon emissions trajectory (as documented in the first Risky Business report). AEO 2015 projects out to the year 2040. The High-Carbon Reference Case extrapolates the long-term trends in the AEO 2015 forecast from 2040 to 2050 (the end year for the modeling). Economic activity in the High-Carbon Reference Case, measured as real gross domestic product, is 2.2 times larger in 2050 than in 2015, while population grows 29% over that same period. The energy intensity of economic activity (measured as final energy use per real dollar of GDP) drops about 2% per year from 2015 to 2050, reflecting recent historical trends (i.e., the same rate at which the final energy per real GDP ratio fell from 1996 to 2015)8. We then developed four alternative clean energy pathways (described in Section 3 below), each with a consistent set of assumptions about the costs for various technologies and fossil fuels. 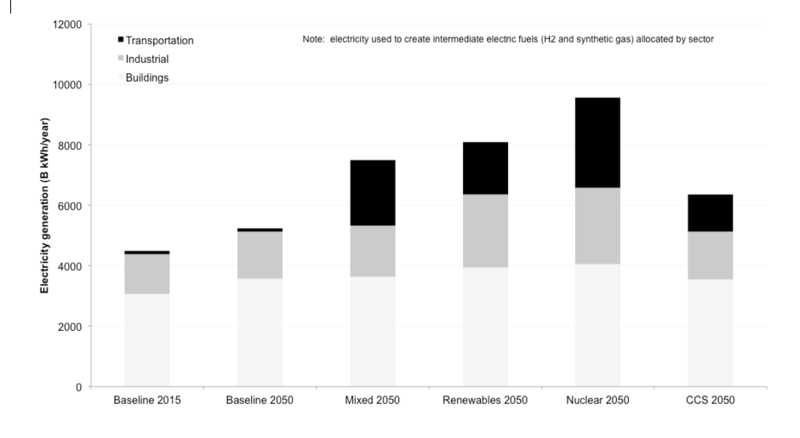 Each pathway assumes different deployment rates and market shares for the three principal sources of low- or zero-carbon electricity: renewables, nuclear power, and fossil generation with carbon capture and storage (CCS). The pathways also assume different potential mixes of low-carbon transportation fuels (e.g., electricity, hydrogen, biodiesel), along with energy efficiency and other technologies. The modeling process is therefore an exercise in testing the feasibility and costs of meeting the same CO2 reduction target (80% reduction by 2050) through different technological and investment pathways. 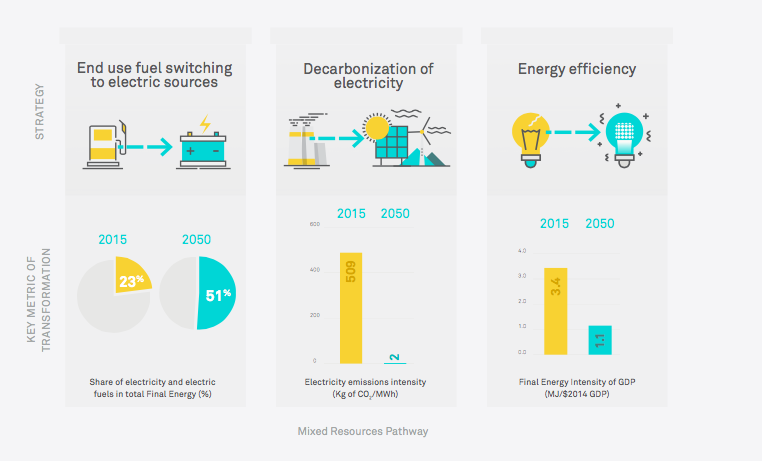 Each of the clean energy pathways meets the reduction target in 2050, demonstrating that a clean energy economy can be achieved without being critically dependent on any single technology. All of the clean energy pathways rely on multiple technologies—they differ primarily in how much they emphasize specific technologies. Uncertainties abound in any modeling exercise, especially those that project decades ahead. We explored one important sensitivity scenario of interest, which relates to the effect of global decarbonization on fossil fuel use in the scenarios. Reductions in fuel use will lower prices substantially. We describe our method for creating a low fossil fuel price case in the below section. The PATHWAYS model generates investment costs, fuel and other operating costs, and total energy system costs for reference scenarios and technology scenarios. Changes in all of these costs can be estimated in a consistent way, and then compared across scenarios, each with a different portfolio of technology investments and fuel consumption. PATHWAYS treats the lumpy nature of investment costs by calculating a levelized cost of energy (LCOE) for each technology. The LCOE takes account of the direct investment costs of the technology; the financial cost of capital for the technology; the lifetime of the technology; and the non-fuel operating costs of the technology9. These parameters are combined to estimate a stream of constant levelized (or annualized) costs for each year the technology operates. The present value of that stream of levelized costs has the same present value as the varying stream of capital and operating costs one would expect in reality. In essence, the LCOE can be thought of as the (non-fuel) cost incurred if one could buy a portion of energy-using capital equipment one year at a time (on a present-value-equivalent basis). PATHWAYS generates estimates of fuel costs year by year, as a function of the fuel consumptions of various technologies and projected fuel prices. The model also projects CO2 emissions associated with all fossil fuel consumed. 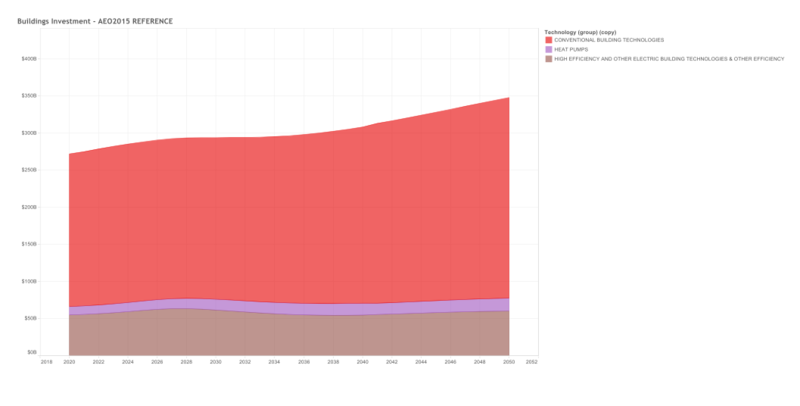 Finally, the projected LCOEs and fuel costs of all the technologies are combined to arrive at an annual projection of total energy system costs out to 2050. Investments in year 2049 yield benefits, of course, for many years after 2050. For this reason, using LCOE to account for investment costs allows for a more valid cost comparison of a reference case and a clean energy pathway, both for a given year and for cumulative years. The PATHWAYS model is not an optimization model, but is used to create internally consistent scenarios that achieve certain emissions targets. Within the constraints of achieving an emissions target, maintaining electric reliability, and emphasizing a particular technology portfolio, the PATHWAYS modelers deploy technologies iteratively in an attempt to minimize total system costs. Some or all of the technologies in the model may be deployed in the modeling process, and the energy system costs are a result of that deployment in the pathway. Let’s assume that the solar PV plant is built in 2020 with a 30-year lifetime. The BEV is purchased in 2030 with a lifetime of 15 years. The heat-pump water heater is installed in 2025 with a lifetime of 10 years. 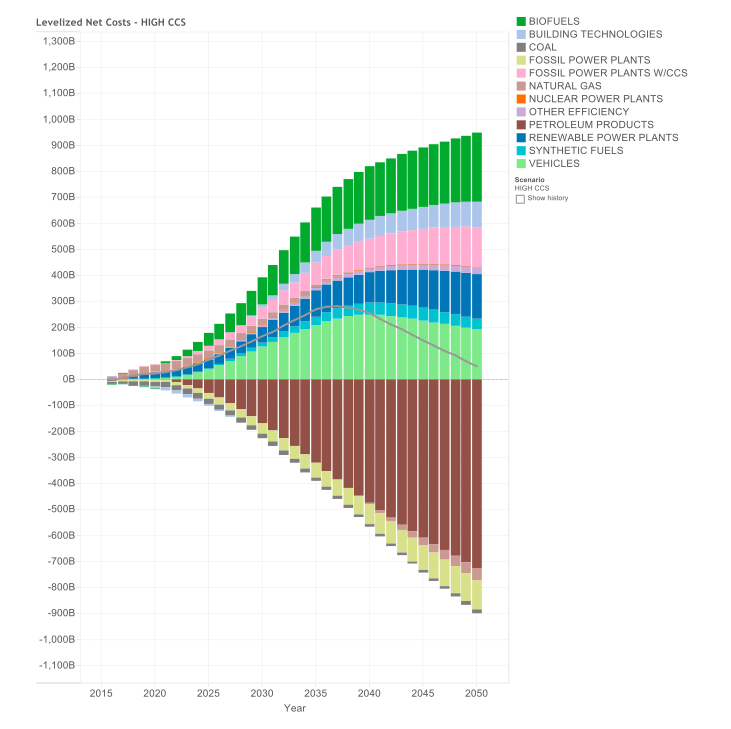 In a clean energy scenario, PATHWAYS would then show the annual LCOE for the solar PV plant in 2020, 2021, 2022, etc. through the year 2049 (i.e., for its 30-year life). The LCOE of the BEV would begin in 2030 and continue each year through 2045. The LCOE of the water heater would begin in 2025 and continue every year through 2035. A different LCOE would be estimated for each of the three conventional technologies, along with fuel costs (coal, gas, electricity, or none) for each option. A new investment (with a new LCOE, assuming costs have changed) is made at the end of each technology’s physical lifetime as capital stock is turned over. This section describes the design of the clean energy pathways. use strategies that mesh with regional infrastructure, resources, and preferences. In operation, these principles lead the model to project a higher level of total energy services delivered for a growing population and a growing economy. In general, per-capita services stay about the same: In the year 2050, consumers would use about the same amount of lighting per square foot of floor space; run their dishwashers about 150 times annually; and dry about 30 pounds of laundry each week. The pathways assume a gradual increase in “vehicle-miles-traveled:” by 2050, people would drive about 10,000 miles per year on average. The constraint of using only commercial and near-commercial technologies excludes some promising technologies from some or all of the pathways. To the extent that some of these technologies become commercial in the coming decades, the pathways would become easier to achieve. The modeling for this report explored four pathways similar to those in DDPP 2015, as described in the next section (Section 3.2). Table A-1-1 below indicates which of 35 key technologies are included in each of the four pathways. The modeling constraint of replacement of capital stock only at the end of its normal lifetime reduces the projected cost of the pathways, but achieving timely replacement remains key to meeting emission targets. Figure A-1-1 below presents the number of replacement opportunities to 2050 for seven types of equipment, vehicles, and facilities. 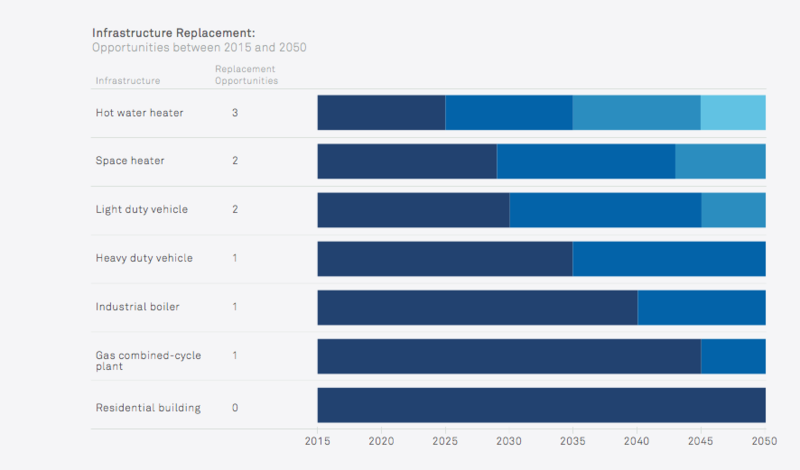 For some of the most important types (e.g., power plants, building shells, and industrial boilers) there is at most one shot at replacement before 2050. Substitute electricity for fossil fuels wherever feasible, across transportation, buildings, and industry. Substitute electric fuels (e.g., hydrogen or synthetic natural gas produced using electricity) where direct use of power is impractical. Deploy biofuels for some transportation end-uses. Raise the productivity of all energy use by improving energy efficiency. The three major sources of electricity in a clean energy economy have very different characteristics. The principal renewable sources, wind and solar PV, are variable and non-dispatchable (although solar thermal and geothermal can be partly or fully dispatchable). Nuclear reactors produce baseload power at high capacity factors but have limited load-following capability. Fossil fuel-fired plants with or without CCS have the most load-following capability, though those with CCS are unlikely to be as flexible as plants without it. These very different profiles led earlier DDPP modeling to explore three pathways that were “corner cases” (i.e., where each of the major sources of clean electricity plays a relatively large role in the future generation mix), and then to examine a fourth “mixed” case in which each of three sources represents a balanced, substantial share of generation. Sections 3.3 and 3.4 of the DDPP 2015 Technical Report provide an in-depth discussion of the five pathway determinants, along with examples of trade-offs and substitutions among clean energy sources. The modeling explored the three corner case pathways described above, which we have named High Renewables, High Nuclear, and High CCS. The fourth pathway, Mixed Resources, explores a balanced mixture of the three sources of low- or zero- carbon electricity. Each pathway also used a different set of assumptions on how the light-duty vehicle fleet would evolve, with each set reflecting a mixture of all-electric vehicles, plug-in hybrids, and fuel cell vehicles. Each pathway also used a different set of assumptions on how much electricity was devoted to production of electric fuels, and the mixture and uses of hydrogen and synthetic gas. Finally, all four pathways included significant improvements in the efficiency of energy use in residential buildings, commercial buildings, and transportation, as well as electrification of various end-use needs in buildings and industry. In all four pathways, the electrification of end-uses results in total electricity use that is higher compared to the High-Carbon Reference Case, however, total final energy use is lower. This reflects the notion that electrification would lead to increased use of electricity, but at the same time, using electricity would often be more efficient (and much lower emitting) than combustion. In addition, increased energy efficiency in all sectors would decrease total final energy use. When remaining fossil fuel use is accounted for, all four pathways would result in slightly less than 750 Mt in CO2 emissions from the energy sector in 2050. Below we summarize the key features of each pathway in the year 2050. 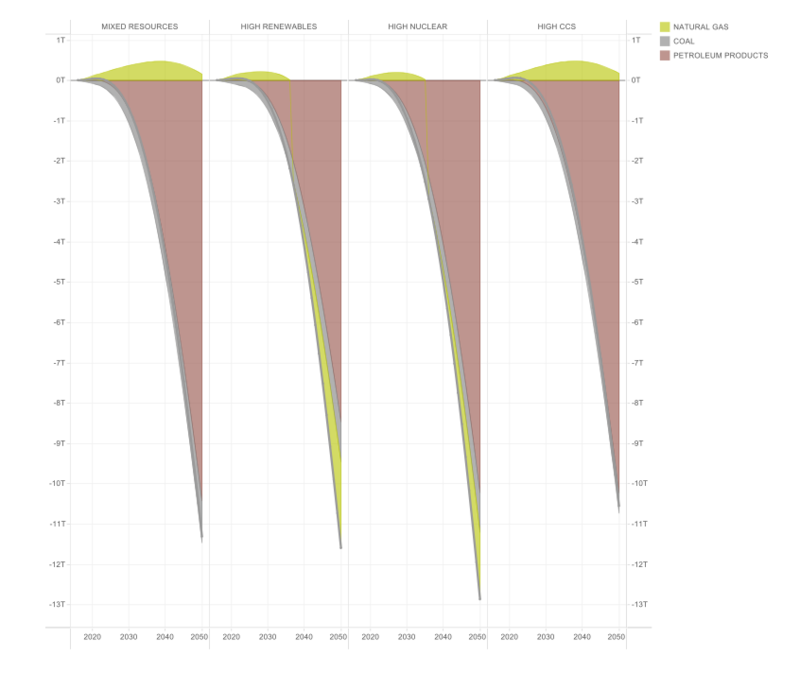 In all cases, electricity emissions intensity drops more than 90% from the reference case projection in 2050. Table A-1.2 below provides more details for the four pathways by presenting key indicators of: emissions; energy demand and supply; sources of electric generation; use of gas, liquid, and solid fuels; and intensity measures related to emissions, energy, and economic output. This section presents an overview of the results for the High-Carbon Reference Case and the four clean energy pathways across the measures of total final energy demand, CO2 emissions, total energy system cost, and investment costs. Subsequent sections present detailed results for energy demand and supply, all GHG emissions, costs, and investments. Current (2015) final energy use is 59 quads (see Figure A-1-2). In the High-Carbon Reference Case, this would grow to 64 quads, reflecting factors such as increases in population, building floor space, and industrial output. However, increased energy use is partially offset by improved energy efficiency (assuming a continuation of current policy and technology trends). 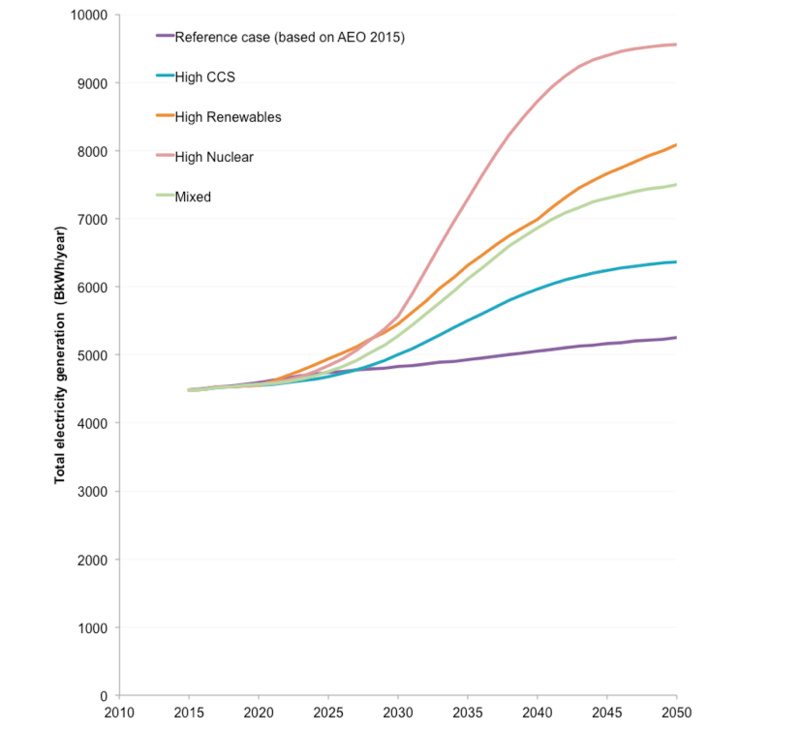 The clean energy pathways would result in final energy use of about 43 quads in 2050, a decrease of about one-third from the High-Carbon Reference Case. Energy-related CO2 emissions in the High-Carbon Reference Case reach 5,372 MtCO2 by 2050, reflecting modest growth from current levels (Figure A-1-3). The four clean energy pathways would result in CO2 emissions below 750 MtCO2, the target level for 2050. Per capita emissions would be 1.8 tCO2 per person, representing an 89% reduction in per capita emissions relative to current levels. The share of electricity and electric fuels in final energy increases from 23 to 51%. The emissions intensity of electricity generation drops dramatically from 509 to only 2 kg of CO2 per MWh. The final energy intensity of GDP decreases from 3.42 to 1.14 MJ per dollar10. Note also that switching end-uses to electricity in the mixed resources case increases electricity generation by about one-third compared to the reference case in 2050. As noted in Section 2, the key economic output of the PATHWAYS model is the change in total energy system cost relative to a reference case. This projection is based on annualized capital costs and includes interest rates appropriate for each sector. The annualization tends to smooth out the cost trends. In the PATHWAYS model, the total annual cost of the U.S. energy system (including both fuel and capital costs for both supply and demand-side equipment) is currently $2.8 trillion . In the High-Carbon Reference Case, PATHWAYS projects a total energy system cost of $4.4 trillion in 2050, in the context of a GDP that roughly doubles by then. Figure A-1-5 below illustrates how the change in energy system cost (in constant 2014 dollars) was projected for the Mixed Resources pathway out through 2050. For each year, the figure displays the change in cost for a component of the energy system. 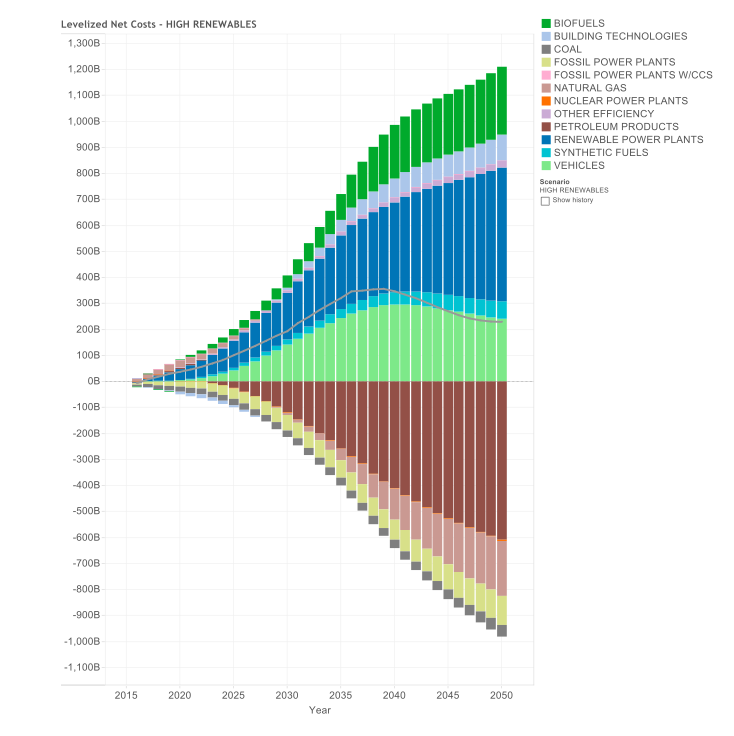 Increased costs show above the zero horizontal axis, e.g., biofuels, building technologies, nuclear and renewable power plants, electric fuels, and the incremental cost of electric and fuel cell vehicles. Spending on natural gas (relative to the High-Carbon Reference Case) increases in the early years and then decreases in the 2040s. 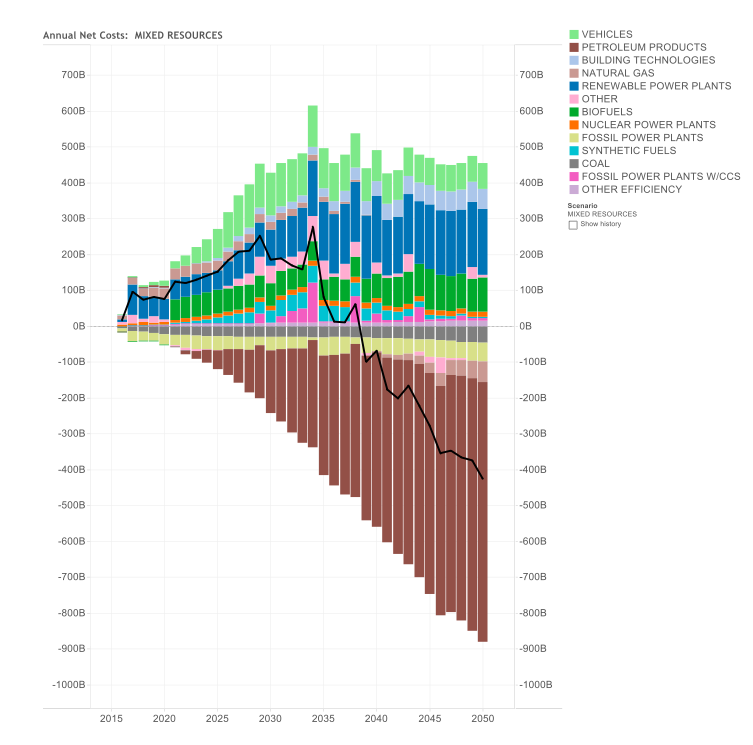 Savings appear as a negative cost below the zero horizontal axis, e.g., reduced spending on petroleum products (chiefly gasoline and diesel fuels), coal, and fossil fuel power plants without CCS. 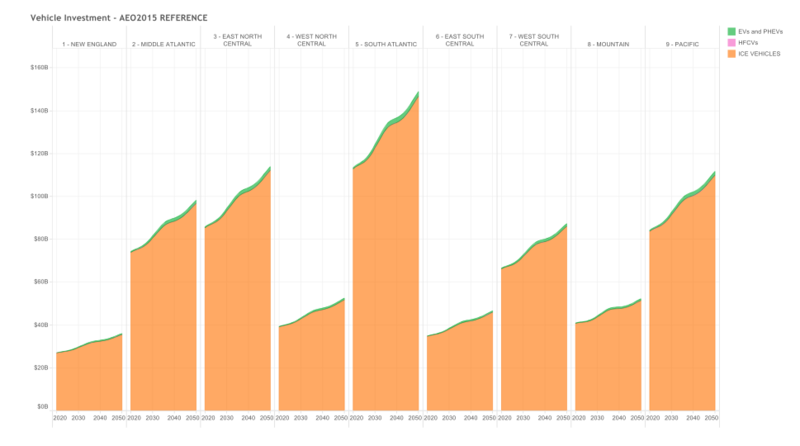 The Net Costs line in gray shows the net cost for any given year, peaking in the late 2030s at roughly $300 billion, and then decreasing to about $50 billion in 2050. Figures A-1-6 through A-1-8 show the same results for the High Renewables, High Nuclear, and High CCS cases, respectively. Our analysis also generates “as spent” costs, which don’t include annualization of capital expenditures, and thus omit interest. 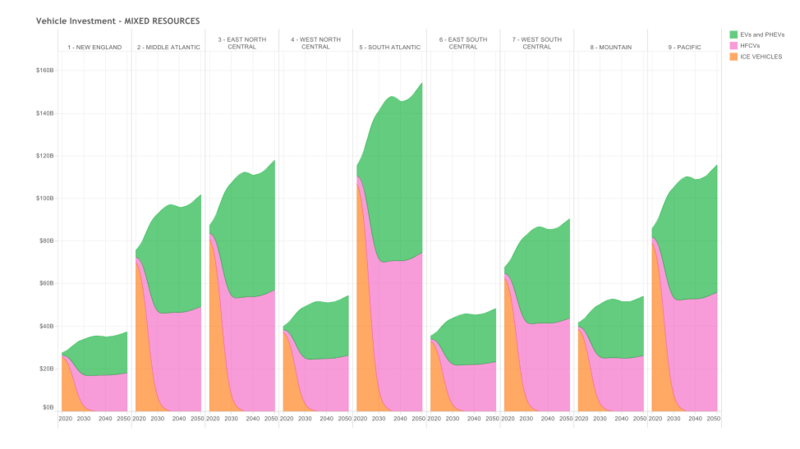 They are by nature “lumpier” than the annualized costs, showing large changes in individual years. Some refer to as spent costs as “cash drawer” or “cigar box” accounting. 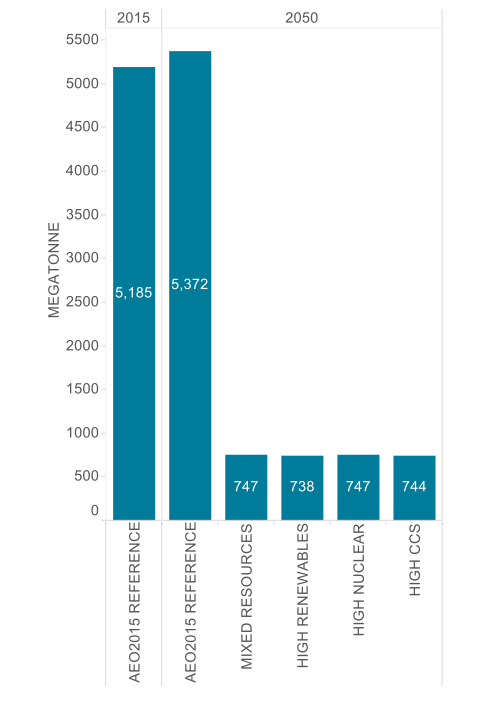 Figures A-1-9 through A-1-12 show the as spent cost projections for the Mixed Resources, High Renewables, High Nuclear, and High CCS cases, respectively. Note: Figure represents changes in annualized costs by component relative to the High-Carbon Reference Case. Synthetic Fuels represents hydrogen and synthetic natural gas. Vehicles represents the increased cost of electric and fuel cell vehicles over conventional internal combustion vehicles. Note: Figure represents as spent changes in costs (not including interest or annualization of capital expenditures) by component relative to the High-Carbon Reference Case. Synthetic Fuels represents hydrogen and synthetic natural gas. Vehicles represents the increased cost of electric and fuel cell vehicles over conventional internal combustion vehicles. Figure A-1-13 shows annualized net energy system costs over time by sector and pathway. 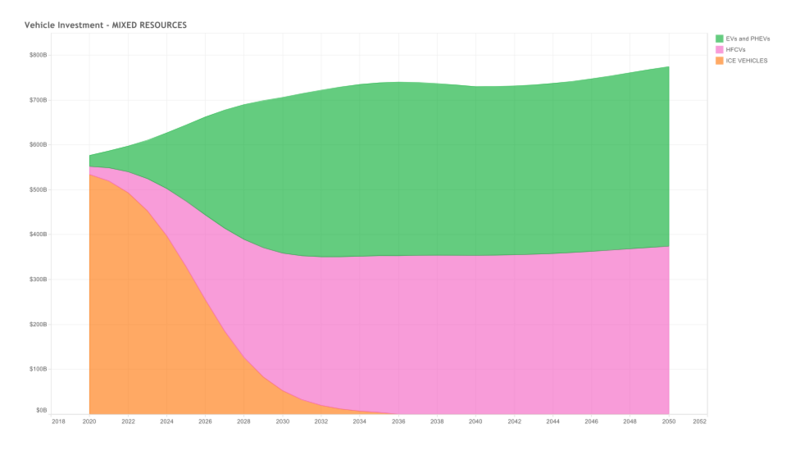 Costs peak in the mid- to late 2030s, ranging between $300B and $400B/year, then fall significantly by 2050. 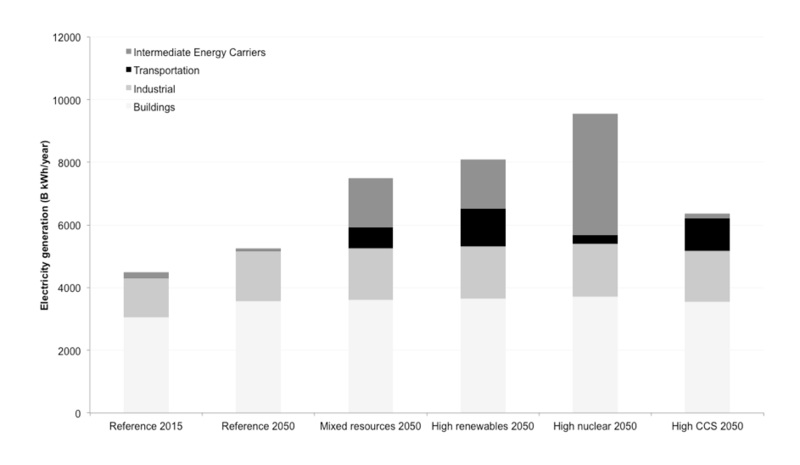 Costs associated with the transportation sector are the largest in all pathways, but the so-called “productive” sectors (industry and agriculture) are also significant in the High Renewables and High Nuclear cases. Table A-1-3 shows the present value of the change in energy system costs from 2020 to 2050 at discount rates at 0, 3%, and 7%11. Higher discount rates reduce the present value of the change in energy system costs, but result in relatively small changes on a percentage basis. The change in energy system costs for the four pathways are projected to be between 3% and 6% higher than the costs in the High-Carbon Reference Case costs across the range of discount rates. By most reasonable yardsticks, the cost of pursuing clean energy pathways appears small compared to GDP. The net annual cost of the Mixed Resource pathway would never exceed 1% of annual GDP from 2020 to 2050, and by 2050 declines to be 0.1% of U.S. GDP (projected to be $40 trillion). The results presented so far used the fossil fuel price projections from the High-Carbon Reference case, which are drawn from AEO 2015. As noted at the outset, we also developed and used a low fossil fuel price scenario to explore the impacts on fuel costs, assuming that a global effort to move toward clean energy succeeds. In such a scenario, major reductions in the demand for fossil fuels would translate into lower global fuel prices. Those lower prices would have at least two major effects: 1) they would reduce the total costs of delivering energy services from fossil fuels to those consumers still using them; and 2) they would make the use of fossil fuels on the margin more attractive. Neither of these effects is modeled in PATHWAYS, and the second factor is particularly difficult to assess prospectively (though it could be offset in whole or in part by carbon taxes). We focused on assessing the importance of the first effect by creating a sensitivity calculation that characterizes fossil fuel price trajectories that could prevail in a world dedicated to deep decarbonization. PATHWAYS is not a partial or general equilibrium economic model, so it does not endogenously project lower fossil fuel prices when demand is projected to decrease. Below we describe the method used to create such a low price scenario, and we summarize the alternative time series of fuel prices that result from our method. We begin with the PATHWAYS time series of base fuel prices for the reference case, shown in Table A-1-4. For crude oil, the base price is the price of Brent petroleum, for natural gas it is the price at Henry Hub, and for coal it is the U.S. mine mouth price (from the U.S. Energy Information Administration’s Annual Energy Outlook, or AEO). PATHWAYS uses these base commodity prices and builds up to get end user prices (for natural gas and coal) and product/end-user prices (for oil) using data on the value chains for each fuel and product. PATHWAYS takes the time series of AEO 2015 prices to 2040 and extrapolates from 2040 to 2050 to get the complete time series for the reference case. Modeling fuel prices accurately is difficult, but the International Energy Agency (IEA), as part of its annual Energy Technology Perspectives (ETP) studies, projects fuel prices (among other results) for two cases that allow us to make a plausible assessment of the percentage change in price associated with deep decarbonization through 205012. These prices are developed using models of the costs of extraction for different fuels around the world. The first IEA case is their business-as-usual reference case (what they call their 6DS case), which implies about 6 Celsius degrees of warming over preindustrial times through 2100. The second case is what IEA labels as the 2DS case, implying climate stabilization at 2 Celsius degrees of warming. The projected fuel prices in those two cases allow us to develop plausible multipliers that we can use to project how fossil fuel prices could decrease with deep decarbonization, consistent with our PATHWAYS High-Carbon Reference Case. Table A-1-4 shows those multipliers for the core commodity prices (crude oil, natural gas, and coal) for five-year increments between 2020 and 2050. These multipliers represent the ratio of 2DS prices to 6DS prices from the IEA ETP scenarios. We apply those multipliers to the PATHWAYS standard prices in each year to create the low price case, then interpolate linearly between those five-year increments to generate the annual time series that the pathways model uses to create the low fuel price sensitivity case. Interestingly, the low price case reduces growth in real prices for all three fuels, but only in the case of coal is real growth in fuel price almost eliminated. The real (inflation-adjusted) price of natural gas still increases 1.1% per year in the low fuel price case, and the real price of oil goes up 1.8% per year (which is much slower growth than in the standard case). 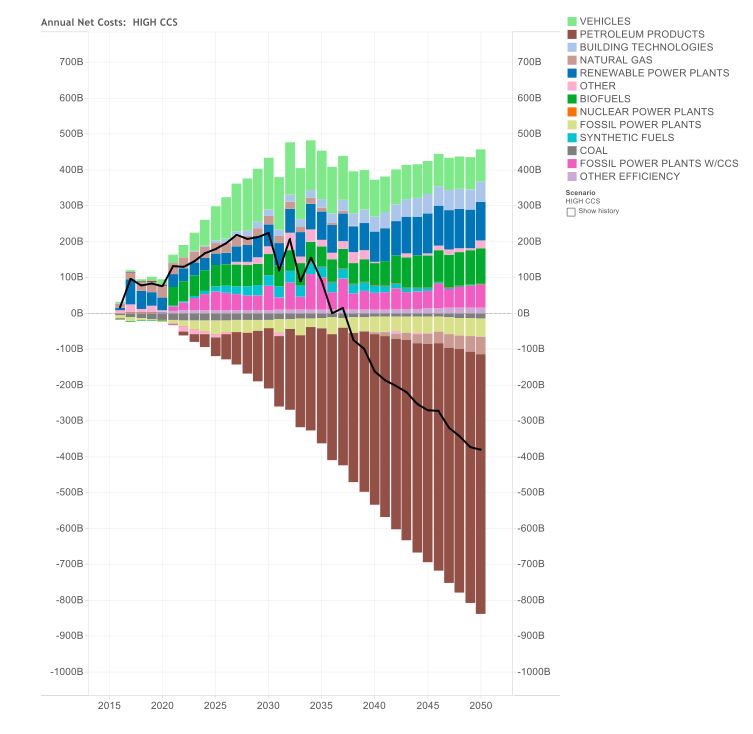 If the transition to a low emissions economy has really taken hold by 2050, a collapse in fossil fuel prices is conceivable (rather than just slowing real growth), but we know of no analytical basis on which to create such a scenario given all the uncertainties (models are notoriously unreliable in periods of underlying structural change)13. Table A-1-5 shows the impact on energy system costs for the low fuel price case. The table compares the change in energy system costs (“net costs”) case for the standard fuel price case to the change in energy system costs for the low fuel price case. With the low fuel prices assumed to result from a global deep decarbonization, the reduction in fuel prices is a benefit that accrues to the pathways. In other words, the clean energy pathways include some continued fossil fuel use (largely for industry and some transportation end-uses), and the cost of those fossil fuels would be lower because prices have declined as demand decreases. The low fuel price case would result in lower net energy system costs in the four pathways, by 3 to 5 trillion dollars (2020-2050, undiscounted). 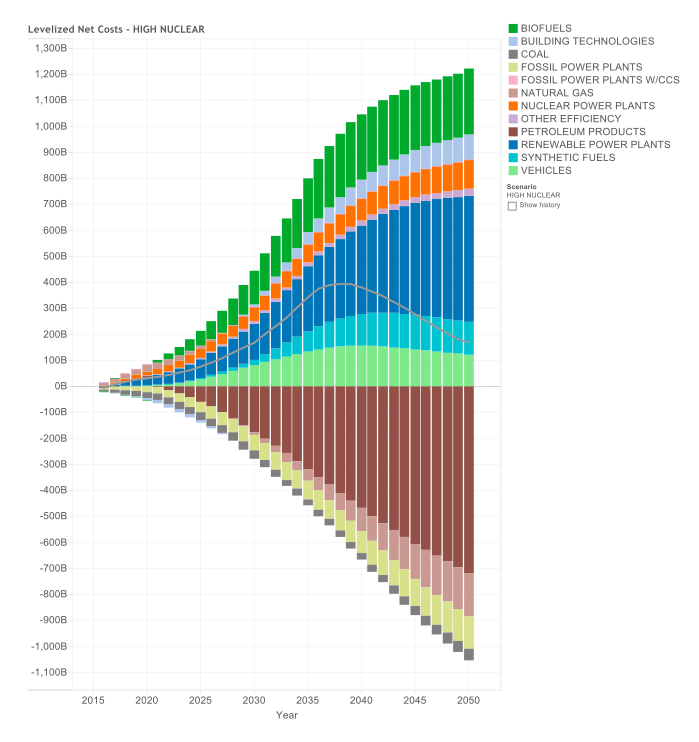 Energy system costs are annualized and summed 2020 to 2050. Reference cost case for the low price case is the same as for the reference fuel price case, because low prices are assumed to come about as the result of deep decarbonization. The change in energy system costs described above would be achieved in large part by a major substitution of capital for fossil fuels. Clean energy capital would also displace some investments in conventional energy that are part of the High-Carbon Reference Case. The U.S. would install more solar panels and wind turbines, build more nuclear reactors, and install CCS on some fossil fuel-burning facilities. The U.S. would build fewer conventional gas and coal plants and would avoid the associated fuel costs. Investments in building shells and equipment would displace natural gas and oil use. Investments in vehicles and power plants would displace gasoline and diesel consumption. 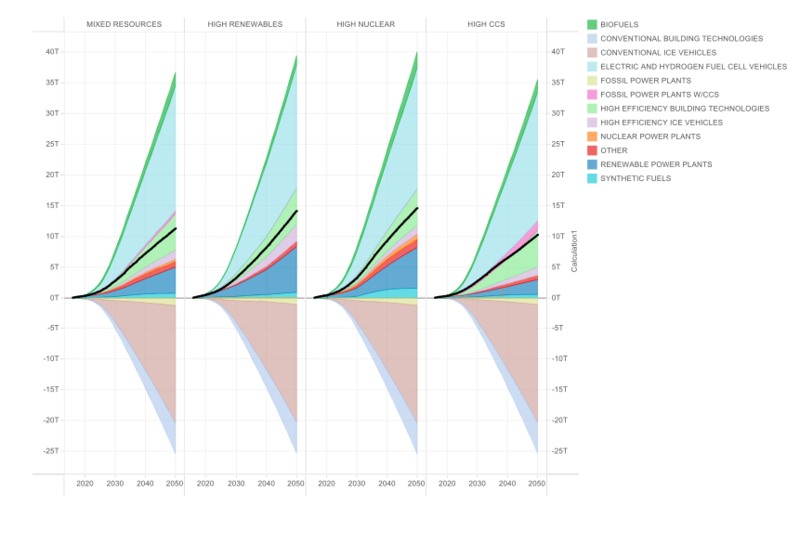 Figure A-1-14 shows the net cumulative additional investments in clean energy in various technologies in all four pathways (above the zero axis), along with displaced investments originally part of the High-Carbon Reference Case (below the zero axis). Investment costs are tallied as spent, and do not include annualization or levelization to reflect different lifetimes. 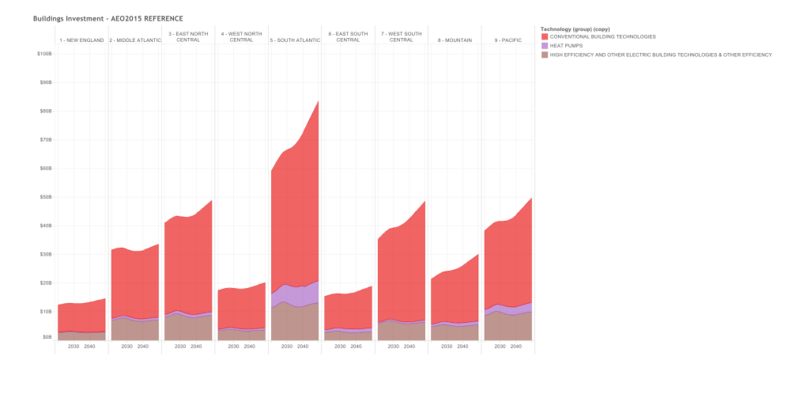 The black line shows the cumulative total net investment. The largest wedges of in the figure are the cumulative investment in electric and fuel cell vehicles and the corresponding disinvestment in conventional ICE vehicles. Other large wedges include high efficiency building technologies and renewable power plants. Investments in clean energy also make it possible to buy less fossil fuel, and these savings nearly offset the additional investment costs in every clean energy pathway on an undiscounted basis14. These net undiscounted savings are shown in Figure A-1-15 below for the four pathways. Fuel savings are presented below the zero axis. Increases in fuel spending are presented above the zero axis. The most dramatic change is the 8 to 10 trillion dollars of savings on petroleum products. Much smaller savings accrue as coal use decreases. 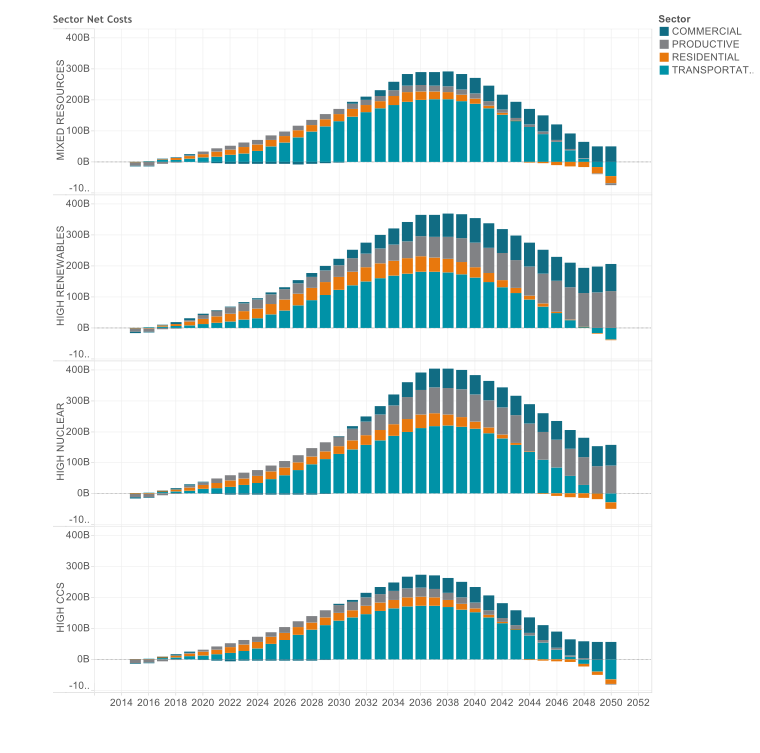 In all four pathways, spending on natural gas increases in the early years, then decreases beginning in the 2030s. In all pathways, the U.S would spend more on capital equipment and less on fuels, with the net (undiscounted) result being at most a modest (roughly 1%) increase in total energy service costs compared to the High-Carbon Reference Case in 2050. Table A-1-6 shows cumulative (2020 to 2050) net energy system costs and investment costs as a percentage of GDP. The pathways show an increase in energy system costs of between 0.5% and 0.8% of cumulative GDP depending on the pathway and the discount rate. Investments (which are as spent, including neither interest nor the savings associated with reduced fossil fuel consumption tallied in the net energy system costs) range between 1.0% and 1.5% of cumulative GDP, depending on the pathway and the discount rate. Cumulative change in energy system costs are the sum of the yearly annualized changes from the High-Carbon Reference Case. They include interest costs. Cumulative investment costs are the sum of yearly “as spent” changes investments from the High-Carbon Reference Case. They do not include interest costs or the benefit of reduced fossil fuel expenditures. This section describes how energy would be used in the clean energy pathways. In all cases, population increases by 29% and GDP is 2.2 times higher in 2050 than in 2015, as shown in Table A-1-2 above: both of which would drive up demand if all other things were equal. But all other things are not equal in the clean energy pathways: Each of the pathways includes: (1) increased electrification (including creating intermediate fuels from electricity); (2) higher efficiencies of energy use; and (3) some minor changes from mode shifting in transportation, such as moving cargo from trucks to trains. The rate of change in final energy per unit of constant dollar GDP from 2015 to 2050 is about -2%per year in the High Carbon Reference Case and about -3% per year in the Mixed Resources pathway. Electrification also often results in higher efficiency, because electricity is more efficient at performing many tasks than combustion. The result is that final or end-use energy demand goes down in all the clean energy pathways compared to both 2015 and the 2050 High-Carbon Reference Case, but primary energy demand goes up compared to 2015 in the High CCS pathway, due to less efficient electricity generation with carbon capture and conversion losses inherent in converting fossil fuels into electricity. Electricity use increases substantially in the clean energy pathways (increasing by anywhere from 50% to 120% in the clean energy pathways compared to 2015, and increasing by 20% to 80% in the clean energy pathways compared to the 2050 High-Carbon Reference Case value). 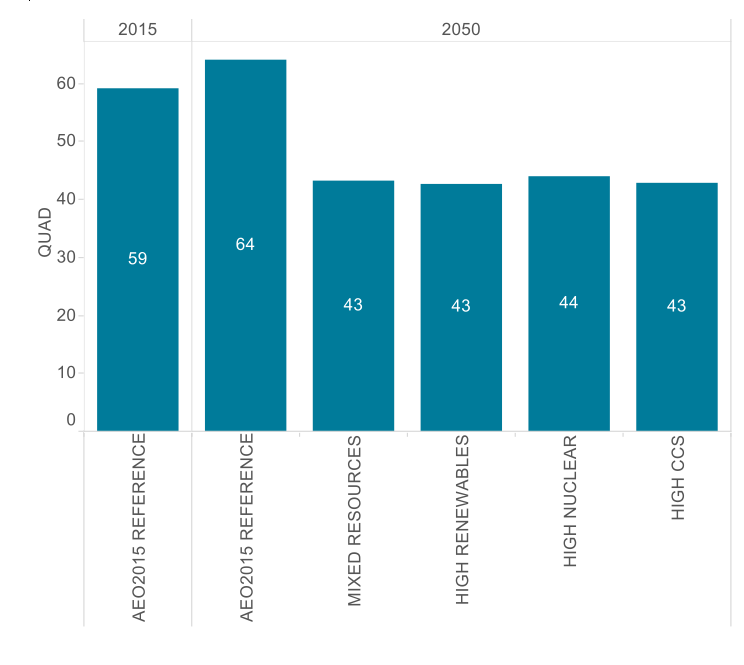 Electricity and electric fuels move from being about one-fourth of final demand in 2015 to more than half of final demand in 2050 for the Mixed Resources pathway, so the shift is substantial. This result is one of the most significant ones from the modeling: The clean energy pathways all rely on electrification of many end uses, especially in the transportation sector, compared to the High-Carbon Reference Case. The next sections summarize how end-use demand would change in each of the major sectors in the clean energy pathways compared to today’s demand. Buildings used three-fourths of U.S. electricity in 2015, so efficiency improvements in this sector (combined with electrification as long as there is also an increase in zero- and low-carbon electricity generation), significantly reduce greenhouse gas emissions (see case studies). The most important uses of natural gas in buildings, space heating and water heating, are almost entirely switched to electricity in all pathways by 2050. This shift means more extensive use of electric heat pumps, which are very efficient at heating and cooling. Energy efficiency in buildings also increases substantially, with big improvements in lighting, building insulation, heating, cooling, water heating, and other applications. The most important lighting improvement is adopting light emitting diode (LED) technologies, which will become universal well before 2050. Heat pumps bring greater efficiency to space heating, cooling, and water heating, while innovations in clothes washers, dishwashers, and other appliances also bring reductions in energy use. The industrial sector is less affected in the clean energy pathways than are buildings and transportation. The lower rate of electrification of industry than in buildings (along with smaller efficiency improvements) results in only modest changes in industrial final energy demand compared to reference case levels in 2050. There is process fuel switching to electricity in some sectors. In iron and steel production, for instance, electric arc furnaces with different iron feed stocks substitute for the coking coal and refinery gas intensive processes common for basic oxygen furnaces. Some heating and steam production is also electrified, but the effects of switching to electricity are much smaller than those for buildings. End-use efficiency improvements are less important in the industrial sector compared to buildings. That’s because industry has already captured many of the savings from greater efficiency. This sector’s high energy costs—and relative infrequency of the “agency problem” that hinders efficiency investments in buildings—have already led to substantial efficiency improvements. Decision makers in industry are also generally better informed about efficiency options than in the buildings sector. The clean energy pathways see some direct switching away from diesel fuel in agricultural pumping and construction vehicles, but these effects are relatively small. The analysis shows that creating a clean energy economy requires major changes in how we use energy in transportation. Those changes include powering vehicles and planes with electricity or cleaner liquid fuels (such as biofuels and hydrogen), adopting new technologies to boost the efficiencies of every type of transportation, and switching from some modes of transportation to others. The magnitude and extent of these changes mean that the transportation sector is the most complicated one in the analysis. Electrification in particular allows for substantial improvements in efficiency, so that final energy demand for light duty vehicles (LDVs) falls two-thirds in 2050 compared to the High-Carbon Reference Cases. LDVs use most of transportation energy, and more than 95% of them are battery electric vehicles (BEVs), plug-in hybrid electric vehicles (PHEVs), or fuel cell vehicles (FCVs) in all four of the clean energy pathways by the end of the analysis period. Electrification is also important in transport by rail, but efficiency improvements (rather than electrification or fuel switching) result in reductions in final demand in other parts of the transportation sector (heavy trucks, aviation, rail, medium duty trucking, buses, and military applications, and other uses) of about one-fourth compared to the High-Carbon Reference Case in 2050. Overall, the electrification of LDVs and efficiency improvements in other parts of the transportation sector dramatically reduce total petroleum use, which falls by 80 to 90% relative to today in the pathways. A large share of the remaining petroleum is consumed as a feedstock for manufactured products, rather than being used as a transportation fuel. Efficiency improvements in light-duty vehicles come from reducing mass by using stronger, lighter, and more energy-absorbing materials like carbon fiber (see case studies), improving aerodynamics, and switching to electric or fuel cell power trains. Fuel economy in traditional internal combustion engine vehicles also improves substantially. Hybrid power trains bring greater efficiency to medium-duty trucks and buses. Other efficiency improvements are important for aviation and rail. Heavy-duty trucking and aviation could rely more on biomass-derived fuels, though the challenges of making such biofuels cost-effectively remain daunting (see case study, Sec. A-4). Alternatively, trucks and buses could switch to electric power from batteries or hydrogen-based fuel cells15. The analysis did not explicitly model changes to the urban landscape, land use patterns, the pace of smart growth development, or travel demand management that would shift the modes of transportation or reduce vehicle miles traveled (VMT). The High-Carbon Reference Case assumes a 14% increase in light-duty vehicle VMT per capita, which corresponds to the trends embodied in the AEO 2015 forecast. If VMT per capita does decline due to land use changes or mode shifts, however, achieving a clean energy economy would be easier than shown in the analysis. The clean energy pathways include detailed representations of the electricity grid. The model tracks the new transmission and generation needed to keep each regional grid in balance in real time. The costs for this new infrastructure are included in the calculation of both utility rates and the levelized cost of energy (LCOE) for each technology in each pathway. Transforming the electricity grid to handle more renewable energy sources, as is necessary for all four clean energy pathways, requires the construction of new transmission and distribution infrastructure. New transmission is especially important because it allows utility-scale renewable power to be shipped long distances from less populated areas (where it is often generated) to metropolitan areas (where the vast bulk of U.S. electricity is consumed). The distribution system also needs to be upgraded to function well in a world where many utility customers are both consumers of grid power electricity and suppliers of electricity to the grid, through photovoltaic and other on-site or local generation technologies16. The grid must also be able to handle the often rapid variations in power output from many renewable sources. The percentage losses from transmission will go up compared to the High-Carbon Reference Case in a clean energy pathway where more power is shipped long distances, but, in general, high voltage transmission is very efficient. Moreover, these losses could be even higher in the High-Carbon Reference Case, due to warmer temperatures (and therefore greater transmission losses). The analysis therefore slightly overstates the costs of the clean energy pathways, because those greater transmission system losses are not incorporated into the High-Carbon Reference Case. Increased transmission losses in the clean energy pathways will be a relatively small contributor to overall electricity system costs, even in the High Renewables pathway. Distribution losses may go up or down depending on the amount of distributed renewable generation in each utility service territory and how well that generation output matches up with demand17. This section discusses low emissions options for energy end-uses that are hard to electrify, such as heavy trucks and airlines, as well as an energy storage option (hydrogen) that is an alternative to batteries. Hydrogen can be used directly in hydrogen fuel cells (HFC). It also can be burned in internal combustion engines (ICEs), or it can be further converted to synthetic natural gas using a combination of (1) electricity, (2) a source of CO2, and a (3) catalyst18. Figure A-1-16 summarizes the roles of conventional natural gas, synthetic natural gas, hydrogen, and biogas in pipelines in the clean energy pathways compared to the High-Carbon Reference Case. Biogas (methane generated by anaerobic decomposition or other means) would be critically important in the High Renewables pathways, and somewhat important in the Mixed Resources and High Nuclear pathways. Creating synthetic natural gas requires CO2, hydrogen, a catalyst, and energy input in the form of electricity. This fuel plays no role in the Nuclear and High CCS pathways, a modest role in the Mixed Resources pathway, and a more important role in the High Renewables pathway. Even in the latter, however, biogas contributes roughly four times as much pipeline gas energy in 2050 as synthetic gas does. The average carbon intensity of pipeline gaseous fuels would vary by nearly a factor of 10 across the four pathways, as indicated by the kilograms of CO2 per MMBTU, represented by red diamonds on the right vertical axis. Figure A-1-17 shows the dramatic changes in light duty vehicles that would result from the clean energy pathways. Average fuel economy (right vertical axis, represented by red diamonds) increases to 2.5 to 3 times its High-Carbon Reference Case value, while gasoline demand (left vertical axis, represented by bars) is displaced by a combination of electric vehicles, hydrogen fuel cell vehicles (FCVs) and highly efficient hybrid electric vehicles. 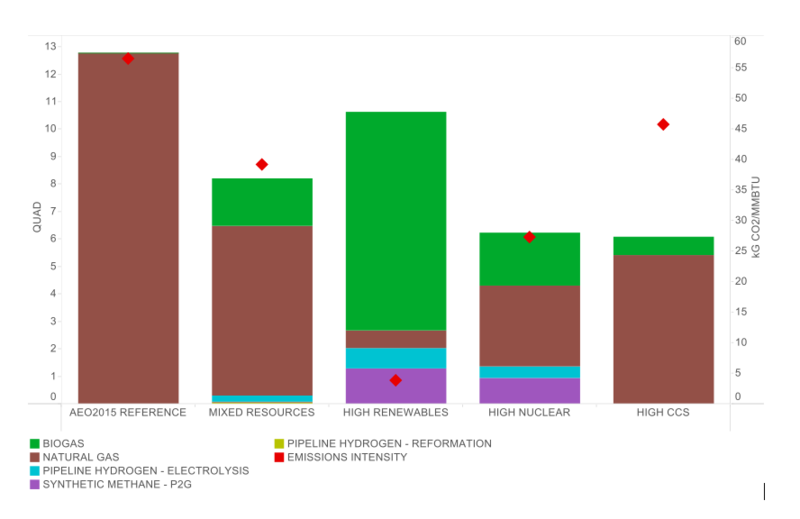 Hydrogen is important for LDVs in the High Nuclear and Mixed Resources pathways, but not significant for the High Renewables and High CCS pathways (this graph implies that the hydrogen being produced in the high renewables case shown in Table A-1-2 (above) is being used in heavy-duty vehicles or in a different sector altogether—it is also used as a storage medium to accommodate variable renewables generation when such generation exceeds electricity demand. Hydrogen fuel cell vehicles (FCVs): Fuel cells convert hydrogen to direct current electricity using a chemical process that avoids combustion entirely. Typical fuel cells achieve between 40 and 60% efficiency19, which is substantially higher than the efficiency of internal combustion engines (ICEs) in vehicles. Using a fuel cell is one way to power electric motors in vehicles. Such vehicles benefit from regenerative braking and other advantages of electric drive, while avoiding issues related to storing energy in batteries (such as slow charging). However, creating and storing hydrogen isn’t easy, and it’s an open question as to whether fuel cells can successfully compete with batteries if battery prices continue to decline 8% per year20. Fuel cells suffer from two chicken-and-egg problems. The first centers on learning rates for fuel cell manufacturing, which have been studied, but not extensively21. Fuel cells are produced at relatively small scale, so it’s been difficult to achieve substantial cost reductions over time. The high costs, in turn, have prevented fuel cells from being made in the larger production volumes required to reduce costs substantially though process and technical innovations. The second problem is that widespread use of hydrogen fuel cells requires a fueling infrastructure that is geographically dispersed and cost effective. But there’s no need for that infrastructure as long as few fuel cell vehicles exist. Solving this problem requires expending considerable resources to build the infrastructure while also making a simultaneous policy commitment to manufacturing large numbers of FCVs. One way to catalyze synergistic investments, which California is doing, is to focus infrastructure investments geographically and then encourage vehicle manufacturers to target FCV sales to those regions where the infrastructure will be able to support the FCV fleet. The fueling challenge is less daunting for electric vehicles, because in the U.S. the electric grid is already everywhere. In the clean energy pathways, some electric infrastructure must be built to meet the demands of a highly electrified fleet. But that task is far less difficult than building an entire hydrogen distribution system from scratch nationwide. Widespread use of FCVs would likely start with fleet vehicles using central fueling stations, however, making the chicken and egg issue less critical in the beginning. Biofuels. The technology exists to create large amounts of biofuels from non-food sources, such as agricultural waste, municipal waste and dedicated energy crops like switchgrass (see case study, Sec. A-4). Such feedstocks reduce the “food vs. fuel” controversy that surrounds ethanol made from corn, but there is still concern that dedicating arable land to biofuels production displaces land necessary to grow food for a growing world population. Currently, production methods for the biggest biofuel –corn-based ethanol—remain energy- and GHG-intensive. The clean energy pathways would deploy different technologies and feedstocks, and electric vehicles and FCVs would replace ethanol and gasoline in fueling LDVs. Instead, biofuels would play key roles elsewhere: In addition to biogas applications, biodiesel would be used in heavy-duty trucks, buses, and international shipping (except in the High Renewables pathway). Biodiesel and jet fuel derived from plant sources are also important in the clean energy pathways because they can “drop in” to seamlessly power existing diesel and jet engines. They also have been proven in both demonstration projects and commercial production (see case study, Section A-4), and there are few other options for reducing emissions of long-haul heavy trucks and airplanes. The means to produce both fuels are well established, and no technological innovations would be needed to accomplish it. It’s only a matter of scaling up. Autonomous vehicles sensitivity analysis. As we showed above, transportation is the most important sector when considering costs of transitioning to a clean energy pathway. One of the most disruptive upcoming transportation technologies could be the emergence of electrically driven Autonomous Vehicles (AVs) to meet passenger transportation needs. Widespread deployment of such vehicles could alter the timing of changes in the composition and performance of the Light Duty Vehicle (LDV) fleet, which would in turn affect investment costs, electricity demand, and final energy demand. We therefore commissioned Evolved Energy Research to produce a report on how AVs might alter the pathway to a clean energy economy22. Because AVs have much higher load factors, the economics of the shift to electric vehicles is significantly improved compared to standard vehicles, which is probably the largest effect of widespread adoption of this emerging technology. A shift to AVs would result in about 25% more vehicle miles travelled in the aggregate in 2050 (because of the decline in cost per mile travelled and the increased access to vehicle travel by currently underserved populations). In the AV sensitivity pathway, this increase in VMT would be offset by reduced gasoline use by plug in hybrid electric vehicles. Emissions associated with AVs would also be mitigated by the rapid decrease in the emissions intensity of electricity generation in all four pathways. All of the factors discussed above influence total energy demand, electricity demand, technology investments, electricity generation, and fossil fuel consumption. Because the clean energy pathways substitute technology investments for fuel in order to achieve GHG emission reductions—and because electricity can be generated with zero- and low-carbon sources, which favors electrification of transportation and industry with direct electricity use and use of intermediate energy carriers—this strategy increases total annual electricity generation compared to the High-Carbon Reference Case. Figure A-1-18 summarizes total electricity generation for each of the clean energy pathways (for the entire U.S.). 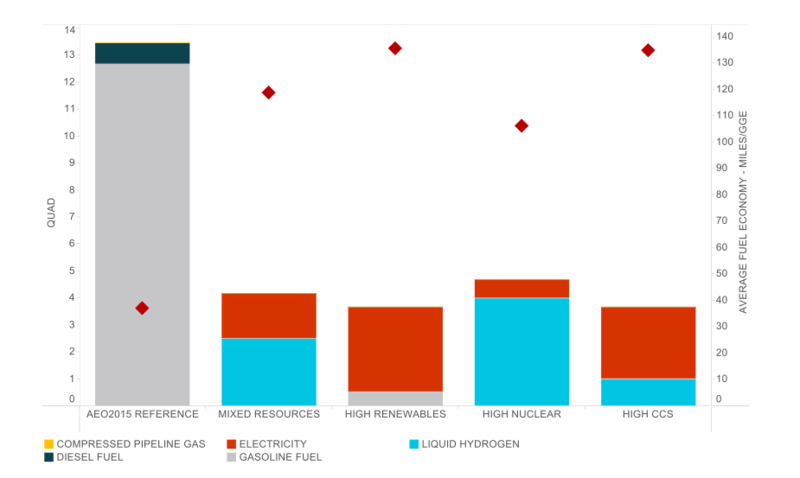 Figure A-1-19 shows electricity generation allocated by sector, including intermediate fuels created from electricity (such as hydrogen and synthetic gas). Transportation, industry, and electrical fuels stand out as significant areas of increased demand and generation in the pathways, but their importance varies significantly depending on the deployment assumptions embedded in each pathway. The increase in the size of each sectoral bar in Figure A-1-19 indicates growth in direct use of electricity from fuel switching. A different sectoral picture emerges when we allocate the intermediate energy carriers to the sector in which they are consumed, as in Figure A-1-20. The effect on the transport sector is most dramatic, while intermediate fuels in industry are most important in the High Renewables and High Nuclear pathways. Building sector electricity use is not as much affected by consumption of intermediate fuels. Nationally, total annual energy system investment will increase from $1.1 trillion in 2015 to $1.5 trillion in 2050 in the High-Carbon Reference Case. In the Mixed Resource pathway, we’ll be investing nearly $350 billion (roughly one-fourth) more per year in 2050, for a total of $1.85 trillion in 2050. But a clean energy economy will shift investment and spending by both technology and geography: some technologies are more cost-effective in some regions than others, so each of the different pathways will increase spending differently across regions. The Clean energy pathways therefore analyze total investment by technology type for each of the nine regions (also called census divisions) shown in Figure A-1-21. Not surprisingly, the much higher level of investment required in the Mixed Resources pathway compared to the High-Carbon Reference Case results in higher levels of investment in all nine of the regions. 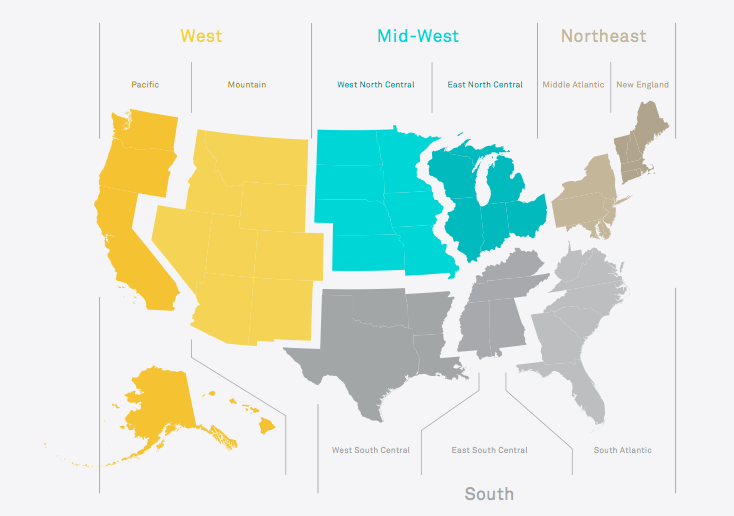 Each region has a different existing mix of generation technologies, building stock, and levels of energy efficiency associated with buildings, industry, and transportation. Therefore, the specific deployment of low- and zero-carbon technologies varies across the regions in both the High-Carbon Reference Case and the Mixed Resources pathway. The result is that the regional mix of electric generating technologies—which is dependent on both the existing portfolio and the region-specific low- and zero-carbon emission technologies which are most cost-effective within that region—varies most dramatically across the regions. Other sectoral investments, such as those for buildings and transportation, are more similar across the regions. Moreover, the magnitude of investment varies because the scale of the overall economy varies across the regions. The figures below summarize the national and regional investment results for the Mixed Resources pathway in comparison with the High-Carbon Reference Case for three broad classes of investment: (1) electric generation, where investment increases for low- and zero-carbon generating technologies but declines significantly for conventional fossil-fired thermal generation; (2) buildings and associated technologies, where investment increases for heat pumps and energy efficient buildings but declines for conventional buildings; and (3) transportation technologies, where investment increases for PHEVs, EVs, and FCVs but decreases for conventional ICE vehicles. The electric generation sector shows the widest variation among the regions. Within the other two broad classes of investment, however, a consistent pattern emerges: Any declines in investment in conventional high-carbon technologies are quickly replaced and typically exceeded within each region by investment in clean energy economy technologies. There is not always a one-for-one match, and some regions will face greater investment reductions in some sectors (e.g. electric generation) that may not be compensated for by greater investment within that sector. Greater investment in another sector (e.g., energy efficient buildings) within that region will generally exceed the lost investment, however, because all nine regions show higher levels of net investment in the Mixed Resource pathway than the Reference case. Figure A-1-22 through A-1-25 illustrate this pattern for the buildings sector for the Reference case and Mixed Resources pathway, first for the US as a whole, then for the nine U.S. regions. Figure A-1-26 through A-1-29 show investments for vehicles for the Reference case and Mixed Resources pathway, first for the U.S. as a whole, then for the nine U.S. regions. Some of the biggest reductions in investment come through reduced investments in ICE vehicles (which includes what consumers spend to purchase those vehicles). 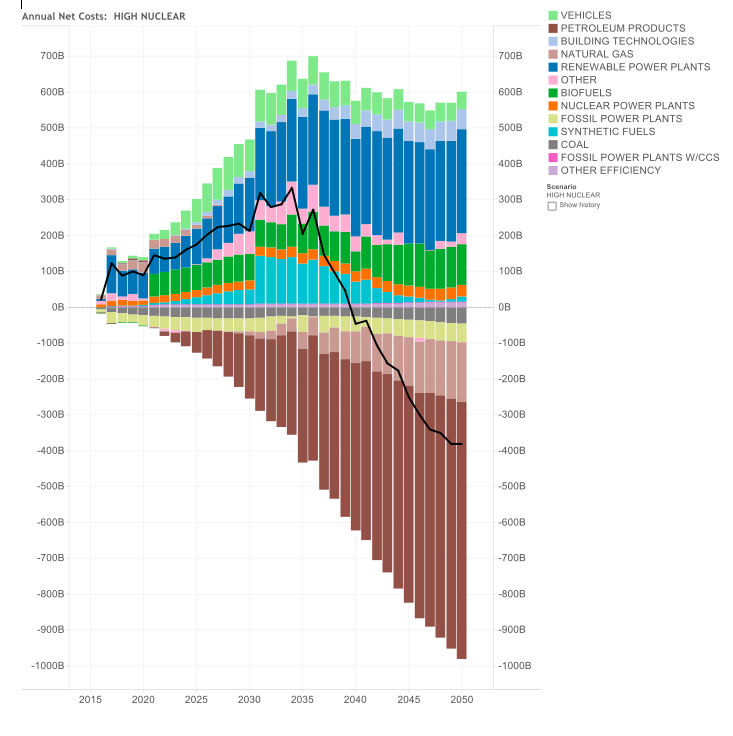 However, the decline in ICE investment is made up through increased investment in PHEVs, EVs, and FCVs. The electric generation sector shows a less consistent pattern, and it varies more by region. Figure A-1-30 through A-1-33 show investments for electricity generation for the Reference case and Mixed Resources Pathways, first for the U.S. as a whole, then for the nine U.S. regions. The investments are significantly lumpier in the Mixed Resources Pathway than in the reference case, particularly on a regional level.